A very affordable small slim line storage solution when space is limited. 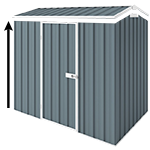 The colour YardSaver F42 steel garden shed is a very affordable small slim line storage solution when space is limited. It will fit under most eaves and you will be surprised how much you can store in it! Shed assembles with Spanbilt Fasttrak assembly system and comes with step by step illustrated installation guide to make sure the assembly is a quick and easy project.